“At DreamWorks Animation, our creative ambition has never been greater and the release schedule we’re unveiling today is designed to give our movies the time and resources they need to realize their full potential so each one can become a true event for our audiences,” said Jeffrey Katzenberg, Chief Executive Officer of DreamWorks Animation. “Thanks to the extraordinary talent base at DreamWorks Animation today, our feature film slate is full of both original story ideas and exciting new franchise chapters that will form a solid foundation for the studio’s creative output through 2014,” added Bill Damaschke, the Company’s Chief Creative Officer. Kung Fu Panda 2 will be released on May 26, 2011. It is being directed by Jennifer Yuh Nelson (Kung Fu Panda), produced by Melissa Cobb (Kung Fu Panda) and written by Jonathan Aibel & Glenn Berger (Kung Fu Panda). It stars Jack Black, Angelina Jolie, Dustin Hoffman, Gary Oldman, Jackie Chan, Seth Rogen, Lucy Liu, David Cross, James Hong and Michelle Yeoh. In the sequel, Po is living his dream as The Dragon Warrior, protecting the Valley of Peace alongside his friends and fellow kung fu masters, The Furious Five. But Po’s life of awesomeness is threatened by the emergence of a formidable villain, who plans to use a secret, unstoppable weapon to conquer China and destroy kung fu. Po must look to his past and uncover the secrets of his mysterious origins… only then will he be able to unlock the strength he needs to succeed. Puss In Boots will be released on November 4, 2011. It is directed by Chris Miller (Shrek the Third) and produced by Joe Aguilar (Merry Madagascar) and Latifa Ouaou (Monsters vs. Aliens). It is being written by Tom Wheeler (The Cape). Andrew Adamson (Shrek, The Chronicles of Narnia) and Guillermo del Toro (Pan’s Labyrinth) are serving as executive producers on the film, which stars Antonio Banderas, Salma Hayek, Zach Galifianakis, Billy Bob Thornton and Amy Sedaris. Way before he ever met Shrek, the legendary Puss In Boots goes on a heroic journey, teaming up with mastermind Humpty Dumpty and the street-savvy Kitty Softpaws to steal the famed Goose that lays the Golden Eggs. It’s the adventure of nine lifetimes! 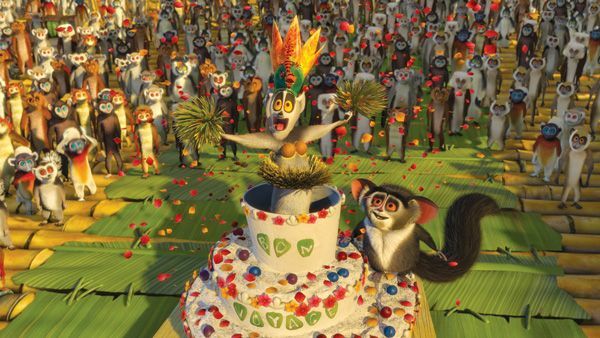 Madagascar 3 will be released on June 8, 2012. It is directed by Eric Darnell (Madagascar, Madagascar: Escape 2 Africa) and produced by Mireille Soria (Madagascar, Madagascar: Escape 2 Africa) and Mark Swift (Madagascar: Escape 2 Africa). It is being written by Noah Baumbach (Fantastic Mr. Fox) and once again stars Ben Stiller, Chris Rock, David Schwimmer, Jada Pinkett Smith, Sacha Baron Cohen, Cedric The Entertainer and Andy Richter. Alex the Lion, Marty the Zebra, Gloria the Hippo, and Melman the Giraffe are still fighting to get home to their beloved Big Apple and of course, King Julien, Maurice and the Penguins are all along for the comedic adventure. Their journey takes them through Europe where they find the perfect cover: a traveling circus, which they reinvent – Madagascar style. Rise of the Guardians, based on the forthcoming books by William Joyce, will be released on November 21, 2012. It is directed by Peter Ramsey (Monsters vs. Aliens: Mutant Pumpkins from Outer Space) and co-directed by Joyce. The film is being produced by Christina Steinberg (Bee Movie, National Treasure) and Nancy Bernstein, long-time head of Production at DreamWorks Animation. Rise of the Guardians is being written by Pulitzer Prize winner David Lindsay-Abaire (Rabbit Hole) and executive produced by Guillermo del Toro and Michael Siegel. It stars Chris Pine, Alec Baldwin, Hugh Jackman, Isla Fisher and Jude Law. More than a collection of the well-known childhood legends, Rise of the Guardians is an epic adventure that tells the story of a group of heroes – each with extraordinary abilities. When an evil spirit known as Pitch lays down the gauntlet to take over the world, the immortal Guardians must join forces for the first time to protect the hopes, beliefs and imagination of children all over the world. The Croods will be released on March 1, 2013. It is being written and directed by two-time Academy Award® nominee Chris Sanders (How to Train Your Dragon, Lilo & Stitch) and Kirk DeMicco (Space Chimps) and produced by Kristine Belson (How to Train Your Dragon) and Jane Hartwell (Shrek). It stars Nicolas Cage, Ryan Reynolds, Emma Stone, Catherine Keener, Clark Duke and Cloris Leachman. The Croods is a comedy adventure that takes us back to a previously undiscovered era in the history of our planet known as the Croodaceous, when nature was still a work-in-progress… full of never-before- seen creatures and landscapes. Audiences will relate to the hilarious family antics as an imaginative and resourceful newcomer helps the Croods navigate their way through the fantastic world beyond their cave. Turbo will be released on June 7, 2013. It is being directed by David Soren (Merry Madagascar), who first brought the project to the studio, and produced by Lisa Stewart (Monsters vs. Aliens). It is being written by Darren Lemke (Shrek Forever After) together with Soren. Turbo tells the story of an ordinary garden snail with an impossible dream: to become the fastest snail in the world. When a freak accident gives him extraordinary speed, Turbo sets out to try to make this dream come true. In Me and My Shadow, which will be released on November 8, 2013, the studio will pioneer a groundbreaking combination of both CG and traditional animation techniques seamlessly together throughout the film. The film is directed by Mark Dindal (Chicken Little, The Emperor’s New Groove) and produced by Melissa Cobb (Kung Fu Panda, Kung Fu Panda 2) and Teresa Cheng (Shrek Forever After, Spirit: Stallion of the Cimarron). It is being written by Tom Astle and Matt Ember (Get Smart). Me and My Shadow tells the story of Shadow Stan, an extremely frustrated shadow who yearns for a dynamic life but happens to be stuck with Stanley Grubb, the world’s most boring human. Finally pushed to the brink, Shadow Stan breaks the singular rule of the Shadow World – “They lead, we follow” – and takes control of Stanley! Mr. Peabody & Sherman will be released on March 21, 2014. It is directed by Rob Minkoff (Stuart Little, The Lion King) and produced by Jason Clark (Monster House, Stuart Little) and Denise Nolan Cascino (Megamind). It is being written by Craig Wright (United States of Tara, Six Feet Under). Robert Downey Jr., Susan Downey, Bullwinkle Studio’s Tiffany Ward and Classic Media’s Eric Ellenbogen are serving as executive producers on the film, which stars two-time Academy Award® nominee Robert Downey Jr. Based on Jay Ward’s classic cartoon, Mr. Peabody is the world’s smartest person who happens to be a dog. He and his “pet” boy Sherman discover that someone has stolen their time traveling WABAC machine and is changing moments in history to disastrous and comical results. It’s up to this most unexpected of father-son teams to somehow put a stop to this villain before his actions destroy the space-time continuum in Mr. Peabody & Sherman. How to Train Your Dragon 2, the sequel to the Academy Award®-nominated original film from 2010, will be released on June 20, 2014. It is being directed and written by Dean DeBlois (How to Train Your Dragon) and produced by Bonnie Arnold (How to Train Your Dragon). Also based on the book series by Cressida Cowell, the sequel is being executive produced by Chris Sanders (How to Train Your Dragon) together with DeBlois. How to Train Your Dragon 2 again stars Jay Baruchel, Gerard Butler, Craig Ferguson, America Ferrera, Jonah Hill, Christopher Mintz-Plasse, TJ Miller and Kristen Wiig.